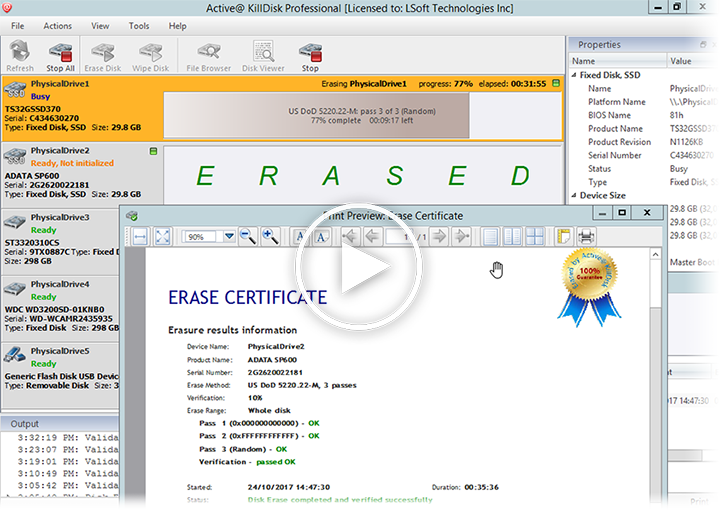 How to erase hard drive by Active@ KillDisk? Disk Eraser, Disk Wiper, Disk Format & Disk Sanitizer. Sanitize all data on HDD, SSD & USB drives. No cost-per-erase! Powerful and portable software that allows you to destroy all data on Hard Disks, Solid State Disks (SSD) & USB disks and Memory Cards, excluding any possibility of deleted files and folders data recovery. Active@ KillDisk is a disk sanitation and partition eraser utility, supporting U.S. DoD 5220.22-M and more than 20 international data sanitizing standards. Licensing assumes no extra cost per erase! Version 11.1 released on May 9, 2018! Hardware solution automatically erases up to 10 disks! KillDisk Industrial Desktop brings a complete and affordable industrial-grade disk sanitation hardware solution to the consumer market. 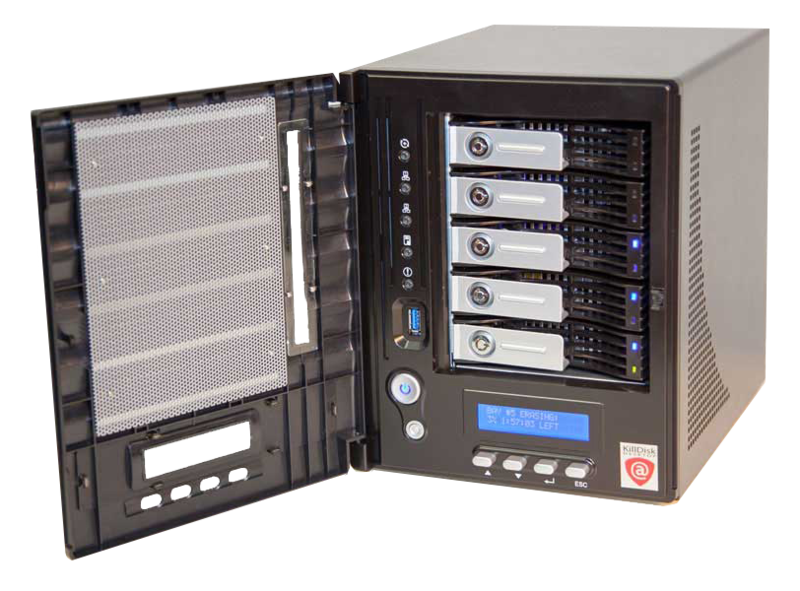 Highly customizable for any context, supporting U.S. DoD erasure and fully automated operation, this system is a must-have for any organization with strong disk erasure requirements. Licensing policy assumes no extra cost per disk erase! Hardware solution automatically erases up to 20 disks! KillDisk Industrial System is an affordable industrial-grade disk sanitation hardware solution combined with Industrial Software and supporting parallel erasure of up to 20 HDD/SSD disks. 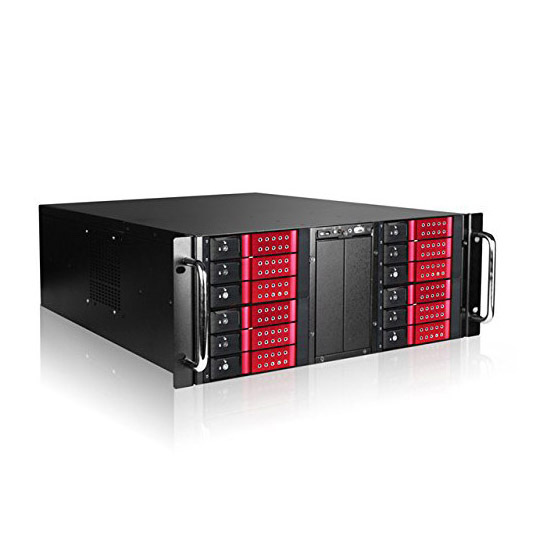 Rack mountable solutions, 3U & 4U form factors. Customizable, quiet & energy efficient. Supports U.S. DoD 5220-22M erasure and 20+ more international sanitizing standards. Supports fully automated operations. Licensing policy assumes no extra costs per disk erase! KillDisk for Industrial Systems is an affordable industrial-grade disk sanitation software solution, supporting parallel erasure of up to 100 HDD/SSDs. Designed for Windows and Linux platforms, this software solution is highly customizable and supports US DoD 5220.22-M (and 20+ more international standards) and allows for fully automated operation. Active@ KillDisk gives you a fast, easy way to delete your files and folders for good if you're getting rid of your hard drive. While it's not as advanced as some other permanent deletion programs, it offers enough bonus features to keep you interested. The professional, welcoming look earns it a few extra points. Simply deleting files, or even formatting the disk, does nothing to stop a determined snoop. This program, a powerful (and free!) set of tools, promises to do something much more useful. ...... once the program has done its job, there is no turning back. We have been using this to satisfy data wiping requirements at the university before disposing of old equipment. It is very simple to use so we are able to have workstudies wiping the drives. It does take several hours on a 3 pass wipe, but I don't think anything can be done about the time due to the nature of what the software has to do. It would be nice if there were audible or more obvious visual prompts that a wipe has completed, so the workstudy can see at a glance without looking at the small status window. The Gutmann method or do you really need to overwrite your drive 35x to be safe? Many of our novice or semi-advanced users of our software have asked us about the famous or infamous Gutmann method and whether is it truly required for disks to be overwritten 35x for data to be securely sanitized once and for all? If you have read our blog on how to delete data you already know that US DoD 5220.22-M or any other method that has 3 passes is good enough for data sanitation. However, since our KillDisk does support Gutmann we find that some explanation is necessary, otherwise “why put something there if you are not using it?”. What happens when a client donates laptops and computers? Is the data securely wiped? At the video blogger Nigel Tombs from Project Reboot uses Active@ KillDisk Professional with HMG IS5 Enhanced (3 pass + verify) and emails a bespoke Sanitisation Certificate. Yes! 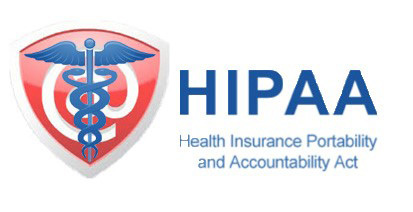 KillDisk helps hundreds of healthcare professionals comply with HIPAA standards across the U.S. by providing data sanitation software to ensure secure health information. In accordance to HIPAA standards §164.310 Physical safeguards, KillDisk provides healthcare organizations with the tools to sanitize data on storage devices prior to disposal or reuse, as well as documentation on the sanitation details in the form of KillDisk’s Certificate of Erasure to maintain accountability and records of secure data erasure. If you have ever found yourself in the situation where you want to delete multiple drives, whether it is because of some confidential data that you want to get rid of or maybe some nasty virus has plagued your drives and you have no ways of removing it, then Active@ KillDisk might be the best solution for you. Active@ KillDisk is a data security application that permanently deletes any data on physical disk drives without any chance of recovering it.